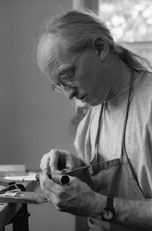 I was born in Liverpool, England, and started my apprenticeship in flutemaking in 1974 at the Flutemakers Guild in London. I was taught by Harry Seeley, a renowned flutemaker and former worker at the Rudall Carte flutemaking company. At the 'Guild' I was given the opportunity to build piccolos, G trebles and concert flutes in sterling silver and 14ct gold. It was here that I was also introduced to the woods used in flutemaking - wooden flutes being a substantial part of the Guild's output. After 5 years, I left London and moved to Germany where I started making flutes at the workshop of Max Hieber, Munich. The workshop was then being led by Werner Wetzel, a maker originally from Markneukirchen who had spent many years in Berlin enjoying a good reputation developing, making and repairing woodwind instruments. It was at this workshop that I was able to improve the skills that I had learned in London and it was not long before I was involved in the making of the whole flute family, from piccolos to contra bass flutes. Within the next years I learned a lot about toolmaking and spent time 'getting to know' other woodwind instruments, learning about their acoustical properties and mechanical aspects. These years of experiment and experience were of great value to me. In 1994, after 20 years of making flutes for other companies, I decided to start my own company. Making instruments to my own style and standard. In the early years at the Flutemakers Guild in London I had always been fascinated by the wooden flutes and their tonal quality. This fascination has accompanied me throughout my flutemaking career. I had started to buy and season various woods in 1980 and it was this wood that became invaluable to me in later years when I started my own company, specializing in wooden flutes and headjoints.